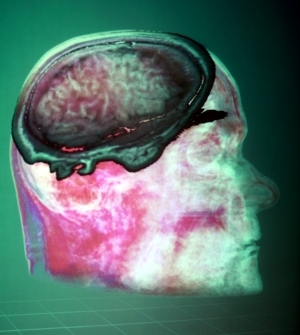 Understanding the connectivity structure of the human brain is a fundamental prerequisite for the treatment of psychiatric or neurological diseases. Probabilistic tractography has become an established method to account for the inherent uncertainties of the actual course of fiber bundles in magnetic resonance imaging data. This work presents a visualization system that addresses the assessment of fiber probabilities in relation to anatomical landmarks. We have embedded our visualization in a virtual reality (VR) application, which increases the spatial perception of structural patterns and enables direct interaction metaphors through tracking of 3D input devices. 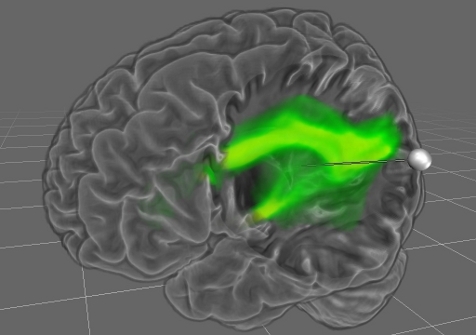 To establish a relationship between nerve fibers and anatomical landmarks, the user can control a virtual flashlight that provides fine-grain control over structural visibility, thereby highlighting connecting fiber tracts. In this project we explore the possibilities and potential of VR interfaces in the domain of neuroscience. We hope that a VR interface may assist the scientist to cope with the ever increasing complexity of algorithms and data modalities.